In a previous post, I asked a question ... How did it all go so wrong, and how do we get it back? The "it" I'm talking about is the power of the Early Church in representing the Kingdom of God and carrying on Jesus's works from the Father, and the spreading of the message of the Gospel of the Kingdom. God has brought so many revelations to me in recent days, and I hope I can organize them into something that makes sense for all of us and shows us the path He wants us to walk. By sending the Holy Spirit in Jesus's Name, that means the Holy Spirit comes in Jesus's place; to represent Jesus in all matters; and to act as Jesus would act in all circumstances. Why? Because both Jesus and the Holy Spirit are sent by the Father to invade the earth and the hearts of men with the very power of God. So... if Jesus is the same yesterday, today, and tomorrow, doesn't it make sense that the Holy Spirit is, too? Which brings me to the big question, If we have the Holy Spirit indwelling us, why aren't we seeing the power of a Holy Spirit-led Church as we do in the Book of Acts? Is there any reason on earth that what we see happening in Acts in the lives of the disciples of Jesus [and the Early Church] should not be happening today and into tomorrow and the future? As I've told you before, I have been earnestly seeking more of God and Jesus, but I have especially wanted more of the Holy Spirit. He is the one who lives inside me and I have often found myself talking to God, the Father, and Jesus [in Heaven] in my prayers, but not recognizing that I have both of Them inside me in the Person of the Holy Spirit, who can express my prayers better than I can! And that's when I really began examining my prayers and how Jesus prayed, and realized I wasn't doing as He commanded regarding prayer. And in my persistent and continual prayer for more of Them, God sent me a movie that literally wrecked me. 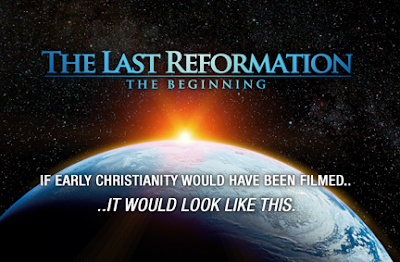 I want to recommend that you watch this movie, called The Last Reformation: The Beginning. Director Torben Sondergaard and filmmaker Lebo Akatio, not only asked those questions that were on my heart, but they answered them and showed me that it is possible for the world to return to those Holy Spirit-infused days of power in the Body of Christ! But why does the Church not believe this? Why do we think that Holy Spirit-filled Believers can no longer lay hands on the sick and heal them; or command demons to come out of a body and they will go; or for a person to be so filled with the Holy Spirit that they are "baptized" with fire and the power of God to see His Kingdom come on earth, as it is in Heaven? This movie gave a concise, and what I believe to be an accurate, synopsis of how the Church was compromised down through the centuries... It is a fact that the Church in the Book of Acts was a living body of Holy Spirit-led Believers; a Disciples Movement, if you will. But when Christianity came to Greece, the Enemy whispered to men, and it became a Philosophy. When Christianity came to Italy, men compromised and it became an Institution. When it came to Europe, the devil convinced men it was a Culture. And when Christianity came to America, it became a Business. And the filmmakers asked this heart-piercing question: If you take a body and make a business out that body, is that not prostitution? Watching this movie, my heart and soul were raised to new heights of passion for the power of God in my life. I saw a raw, visual, and moving image of what the Church is supposed to look like -- what I'm supposed to look like as a follower of Jesus! And I wept from pure joy and hunger from knowing it is still possible and what God wants for every Believer! I know that I have taken the first steps down this path, but I want more! I want the people around me to see the power of God the Father through me, just as the Disciples saw it in Jesus -- and then the world saw it as the Disciples displayed that power as they took it to Judea, Samaria, and the ends of the earth! It wasn't supposed to stop! We can still display that power as representatives of the Kingdom of God! .... And then I received a close-up view of just how compromised men have become in this corrupted and prostituted world. I saw an interview with Dan Brown, the author of The Da Vinci Code and other anti-religion books. My heart was actually quite moved by the depths of his "lost-ness", if I can use that word. When discussing his books, here are a few of his quotes ... "Religion does an enormous amount of good in the world. But at the same time, there are factions in every religion that take the metaphors and the myth of Scripture, and they hold them up as literal fact. That is the danger of any philosophy or religion." (Right there, we see validation of the movie -- Dan Brown sees Religion as a Philosophy, and has no sense of Faith). Then when talking about his new book, Origins, he said this: "Traditionally, all the gods fall. Are we so naive today to believe that all the gods of today won't receive the same fate? Our planet would be fine without religion and we are evolving in that direction". What an explosive contrast to the The Last Reformation! But can you see exactly what Torben Sondergaard was saying? Religion has become a philosophy and, for Dan Brown, a business. There is no power in it --- unless we return to being the Church of the First Century, then we our families, our communities, our nation, and the world will go the way that Dan Brown envisions. BUT we have men like Torben Sondergaard, and Todd White, and Steve Harmon, and David Hogan who are on the front lines to declare that this will never happen! I truly believe that there is a movement of the Holy Spirit in the Body of Christ today -- a movement that actually wrecks the souls and spirits of men and women who are hungry for more of God; who hunger to experience what the Disciples of the Early Church did, when the power of the Holy Spirit literally touched them. And I'm not just talking about the Twelve. There were hundreds, and perhaps thousands, of disciples and followers of Jesus, who received the power of the Holy Spirit to do the works of God on earth -- to do the supernatural miracles and signs of the Kingdom, and to preach and teach the Gospel of God's Kingdom on earth. It is our legacy to join them in that same walk. The Spirit within me won't settle for anything less -- and I have surrendered all to His power. Acts 1:8 "But you will receive power when the Holy Spirit has come upon you, and you will be my witnesses..."
I couldn't agree with you more! I desire to be filled with the Holy Spirit, and touch others just like in the movie. I want people to see Him in me, and I pray that one day that will happen. It can happen! Pray for the Baptism of the Holy Spirit and keep on praying for Him to fill you up! Don't ever stop! And just start laying hands on people, BELIEVING that the power of the Holy Spirit in you is the same power that enabled the Church in the Book of Acts to do God's work here on earth. It is a renewing of your mind to the reality that God wants to invade earth with heaven, and use you as His instrument. Now that you have that knowledge, it's just a matter of DOING IT!